When the weather starts to cool and signs of summer start to disappear: house windows locked shut, farm stands closed for season, outside community events are discontinued and actual signs, too, like an early snowfall. Cut perennials back to soil level and remove debris to the compost pile. 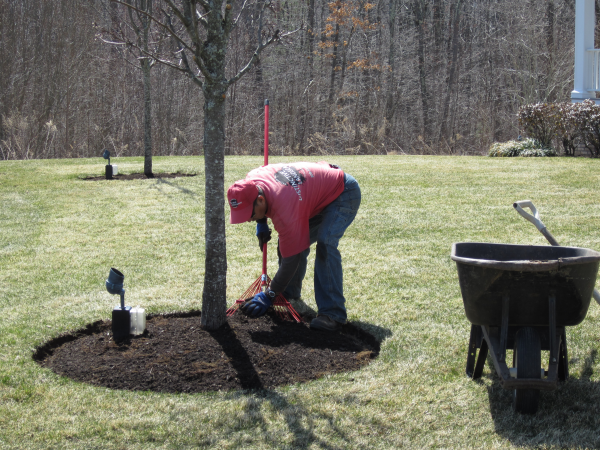 Remove annual plantings in the landscape. Add a layer of mulch or organic matter to plantings to help conserve moisture and protect the root systems, especially for new plantings. Give you lawn a nice tight haircut to 2.5”. Removing debris such as leaves and other dead plant material from the landscape will prevent the spread of certain fungi that can infect new leaf tissue during the following spring. Removing the unwanted debris will also eliminate nesting areas for critters. 7. You may want to consider leaving ornamental grasses and interesting perennials such as: coneflower, black-eyed susan and sedum in the landscape over the winter months. Not only do they add structure and interest to the winter landscape. Did you know? Poison ivy berries are a very important food source for overwintering birds! Consequently, they can also spread the plant this way.